Membership of UKSEDS is free, and open to all. You need to be a member in order to get involved in our projects and competitions, and to volunteer with us. UKSEDS members are recognised by firms, academia, and government alike as being the best and most motivated students in our field. 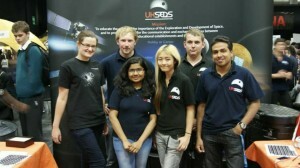 If you’re considering a career in the space sector, then being a part of UKSEDS can help give you access to valuable contacts and opportunities. Our alumni work in space all over the world, including at ESA, Airbus Defence and Space, Thales Alenia Space, the UK Space Agency, the International Space University, SSTL, Reaction Engines, RAL Space, CGI, ABSL Space Products, Telespazio VEGA, and more! If you want to really make the most of membership, you can join the team that runs UKSEDS. We are students and young graduates across the country who organise events, plan projects, lobby industry, and represent the view of students. Alternatively, if your student days are sometime behind you, but you’d still like to help us inspire and educate the next generation, then we’d love to hear from you.